In the years following World War II, outdoor recreation of all sorts, hiking, fishing, hunting, picnics, and yes – even driving – boomed across the United States as many families saw an increase in their income levels and their leisure time. At the same moment, population pressures and suburban development, including in ecologically sensitive areas like shorelines and wetlands, threatened to both degrade and reduce open space and water access. In response, Congress passed the Outdoor Recreation Resources Review Act (P.L. 85-470) in 1958. The bill established the Outdoor Recreation Resources Review Commission (ORRRC) and charged it with not only assessing contemporary recreation needs and wants, but also with looking ahead to the years 1976 and 2000, in an effort to predict what the country’s future recreation demands might be. The Commission included representatives from executive branch agencies, Congress and private citizens. A 25-person advisory council also provided advice as did a knowledgeable staff. Laurance S. Rockefeller served as Chairman of the Commission, with Francis Sargent, who would later become Governor of Masschusetts, employed as the Executive Director. The final documents issued by the ORRRC in 1962 are voluminous. In addition to its summary, Outdoor Recreation for America, the commission also issued an additional 27 study reports (link leads to a free public site where all reports, as well as many other government documents, can be accessed) dealing with all manner of subjects – open space, wilderness, shorelines, recreation in the heavily populated Northeast and development of private outdoor recreation facilities. Two of the Commission’s proposals proved especially significant: a call to create a new recreation-centered agency in the Department of the Interior (DOI) and the associated recommendation that the new entity would manage a federal grant program to aid states in the planning and acquisition of new recreation sites. These potential additions would be highlighted in state comprehensive outdoor recreation plans (or SCORPS as they are commonly known today). In his March 1962 message to Congress on conservation, President Kennedy endorsed much of the committee’s work. He soon moved to implement many of its action items, including the establishment of the Bureau of Outdoor Recreation in the DOI. This move did cause some consternation among more established DOI agencies like the National Park Service, which had been the lead on federal-level recreation since the 1930’s. 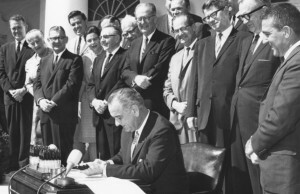 President Kennedy and his Secretary of the Interior Stewart Udall also took steps to establish the proposed grant program, dubbed the Land and Water Conservation Fund,(LWCF) but legislative efforts initially stalled. Ultimately, the momentum to fund outdoor recreation proved too great and a bill (P.L. 88 -578) to create the LWCF passed with bipartisan support in the next session. It would be signed into law on September 3, 1964. A more detailed history of the LWCF program is available on the NPS program site. Initially, as proposed by the ORRRC, the new Bureau of Outdoor Recreation administered the fund. When the Bureau was abolished by the Carter Administration in 1977, a new agency, the Heritage Conservation and Recreation Service (HCRS), assumed its responsibilities. This arrangement proved short-lived however, as HCRS itself faced elimination in 1981 during the early months of the new Reagan Administration. Tasks associated with recreation, including LWCF, as well as other programs including management of the National Register of Historic Places, would then come under the purview of the NPS.